The cruise industry is constantly evolving and expanding, making headlines by introducing breakthrough innovations from top-of-the-line food and beverage to leading technology and environmentally friendly practices. The operations at the very foundation of a cruise line, like Celebrity Cruises, are composed of an abundant number of moving parts. As a recent transplant from NYC's restaurant scene one of the most highly respected, cutting-edge culinary arenas in the world cruising is unlike anything I have previously seen. Sourcing produce in the cruise industry takes on a whole new meaning. 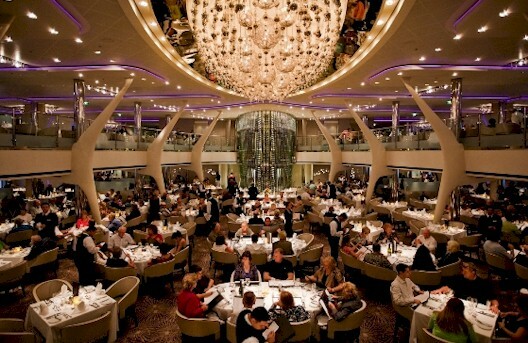 I came to Celebrity Cruises recently having joined its sister brand Royal Caribbean International two years ago. Before cruising, I led a number of restaurant kitchens in New York, most recently as Executive Chef at Michelin-starred restaurant Oceana in Manhattan and as Corporate Chef for the Bolhsen Group, which included the oversight of six venues. I have been fortunate to see and do much in the food and beverage world on land in my 28-year career, and when I was introduced to the cruise industry, it was eye-opening. Several opportunities, processes and challenges are similar across the hospitality and travel industries, but when your venues are moving 24 hours a day, seven days a week, entirely new and interesting factors have to be taken into consideration. Celebrity Cruises is an award-winning modern luxury cruise line and part of the world's second largest cruise operator Royal Caribbean Cruises Ltd. With cool, contemporary design and warm spaces; dining experiences where the design of the venues is as important as the cuisine; and the amazing service, Celebrity Cruises creates an unmatchable experience for vacationers. As a premium brand, our fundamentals are rooted in high-quality and innovative menus as well as planning every intricate detail of the dining experience, from upscale service and restaurant decor tailored for each of our restaurants' identities to the very ingredients that have been specially picked to add that special taste of the destination you're visiting while on your cruise. There are 10 ships in the Celebrity Cruises fleet. They operate at all times and sail from one area of the world to another based on the time of year this allows us to provide our guests with vacations sailing to all seven continents. With that footprint, sourcing product including fresh and top-quality ingredients is incredibly important and a major focus. We embrace a variety of standards and expectations for the products that we identify, purchase, receive (while in port) and prepare for multiple seatings at the 12 distinctive restaurants our guests enjoy onboard our ships. With rich choices and the variety of dining experiences that we offer, our product is sourced from all around the world, thanks to an intricately coordinated system that we have spent years refining. From United States Public Health policies to the standards we follow as a forward-looking vacation company, sourcing our product is carefully done in deep, cross-functional collaboration with several key players on land and at sea.